This year, we inadvertently ended up studying The Underground Railroad because Cuddle Bug kept picking books from that area of the library. That lead to the girls earning a badge from American Heritage Girls about the Underground Railroad. So, a natural fit was to next teach them about the Civil War, which we have been doing using Home School in the Woods‘ Time Traveler American: The Civil War. This isn’t our first time reviewing Home School in the Woods’ products. We have also reviewed Project Passport World History Study: Renaissance and Reformation and HISTORY Through the Ages Hands-on History Lap-pack: U.S. Elections. Another favorite was HISTORY Through the Ages Project Passport World History Study: The Middle Ages. And, since we started homeschooling, Bookworm has used Home School in the Woods’ timeline book. This is, however, the first time I’ve used a Home School in the Woods’ product exclusively for my rising 1st and 2nd graders. While they are on the young end for the product (it’s meant for kids in 3rd – 8th grade), we did have good success with it. 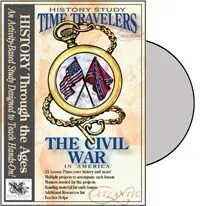 The Time Traveler American series includes The Civil War as well as New World Explorers, Colonial Life, The American Revolution, The Early 19th Century, The Industrial Revolution Through the Great Depression as well as World War II. Like other Time Traveler American studies, The Civil War is comprised of 25 lessons. There are a variety of activities that will appeal to all types of learners including creating an era appropriate newspaper, hands on crafts and activities, era appropriate recipes, a timeline, and penmanship practice, just to name a few. We used this hands-on history curriculum approximately three times a week. The girls loved it! We started by reading the introduction to the first unit and making a lantern representative of the lanterns used in the Underground Railroad. Our lantern was made out of a tin can, and we carefully made holes to represent the Big Dipper and the North Star. At first, Cuddle Bug wasn’t that impressed with the project until it got dark. When we put the candle in, she suddenly saw the Big Dipper glowing, and she loved it! Both girls made me light the candle every night before they went to bed for a few weeks. I love that they got so excited about learning history! I did bypass some assignments such as creating a newspaper because the girls are not that strong in reading and writing, and the assignment would have been too much for them. But even with cutting that part of the program out, there was plenty to keep the girls engaged and busy. PB & J Girl is learning cursive, so she used the penmanship pages to practice her cursive. The ones she worked on contained famous quotes from Robert E. Lee. The girls also did map work including a map of the Underground Railroad routes, and a map of the states that were part of the Union and those that were part of the Confederacy, to name just a few of the activities we did. I love, love, love Home School in the Woods’ products! They are so engaging, and a great way to teach both reluctant and enthusiastic history learners. If you’d like to try out Home School in the Woods’ products, you now have the option to try a la carte products ranging from timelines, to shorter activities, to games. Most run $3.95 to $6.95. Even better, use the code alacarte to get the Erie Canal a la carte product for free!